To ask other readers questions about The Novels of Gillian Flynn, please sign up. Trey Pearce There is no specific order in which they should be read as they are not connected in any way. If you want to read them in publication order then it is…moreThere is no specific order in which they should be read as they are not connected in any way. I don't even know what to say. I regret reading two of Flynns books back to back. I feel like I need therapy now. Started July 23rd 2014 with Dark Places as Sharp Objects might be the BOTM August 2014 read of the Goodreads-Group Psychological Thrillers. Hopefully I will have finished Dark Places until then. Well, Sharp Objects did not become the BOTM read. But I finished Dark Places July 30th, 2014. Nearly tl;dr. The different POVs where expertly concluded, with me guessing the whole time what might have happened at the night of the massacre - and guessing wrong (mostly). The twists up to the conclusion where Started July 23rd 2014 with Dark Places as Sharp Objects might be the BOTM August 2014 read of the Goodreads-Group Psychological Thrillers. But I finished Dark Places July 30th, 2014. Nearly tl;dr. The different POVs where expertly concluded, with me guessing the whole time what might have happened at the night of the massacre - and guessing wrong (mostly). The twists up to the conclusion where pure genius. Solid 4 stars, highly recommended. But why only 4 stars? It could and should have been shorter, for me about 20 %. The descriptions of places, animals and plants where sometimes ok, but sometimes too long and too many for me to be satisfying or needed. The suspense was decreased for me and I sometimes had to push myself to not abandon the book or take a break by reading a different book in between. As this is combined with the other books I will hold off with rating till I have read the first book ( Sharp Objects ) which is much shorter, luckily. But it might be a while until I read it. This book was dark and very troubling, but I enjoyed it. A little disappointed at the end, but still happy I read it. At multiple points in the book I wondered how it was possible that a story like this occurs in someone's imagination. These books do not have bad plot lines - they are actually quite creative and each could have lent itself to a novel that was truly above bar. However, both books entirely fall apart in the delivery. Sorry GF, but the writing just isn't there in either story. I'd definitely give Sharp Objects the edge between the two, but I could have lived without ever picking either up. I loved both of these novels. I preferred Sharp Objects, as I can understand addiction so could better relate to Camille Preaker. I had to devour these books as did not want to stay in the "dark places" too long. All her books are twisted, and even when I thought I knew "whodunit" I was mistaken. Not light hearted reading, but absolutely fabulous! Whew! Both of these are so dark! but still, excellent reads. I didn't figure out the "whodunit" on Dark Places. I tried to give these books a 3.5 rating, but apparently that isn't possible. I enjoyed Sharp Objects more, although when I reflect upon them both, I think the plot and twists of Dark Places are better. Maybe because I read them back to back and was getting tired of Flynn's uber-dysfunctional families? 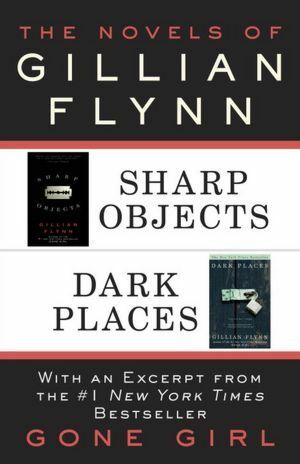 Flynn really is a master of the psychological thriller, with evocative writing that backs up her Byzantine plots. Well - flew through the book, very readable and fast-paced. But also very dark, not for the faint-hearted (me) .... In desperate need of a Disney fix if I'm to have any chance of sleeping tonight. Preferred Gone Girl, as it was more polished and slick. Very disappointed with this book. I picked it up with high expectations as I enjoyed Gone Girl so much. The "mystery" in this story was very easy to guess and the characters were easy to care about. Both dark and twisted but in a can't stop reading kind of way. Her style "recipe" holds true in these two books and are just as enjoyable as Gone Girl. Gone Girl her best. I was not overly fond of Sharp Objects in the least. Just didn't have the climatic tone Gone Girl and Dark Places did. Out of all three of her books I've read, this one was my favorite. So many twist and turns. If you enjoy reading about the dark places of humanity and feeling nauseated from the first word to the last, Gillian Flynn is your author. I strong-armed my gritting teeth through these two books. Never will I choose to read her again. Having said that, Ms. Flynn can weave a tail so completely and honestly it physically hurts. Obviously this style appeals to many, just not to me. After reading all three novels, I have definitely added a new favorite author to my list. Sometimes I saw the movie/series first, sometimes I read the book first. Very well done in any case. A mind that conceives of Diondra and Amazing Amy is a storyteller i want to follow. The author doesn't get stuck in any class, and can tell a story from many perspectives. Love it!! Two for one ebook. Both books were psychological thrillers, had somewhat predictable twists, both were quick reads. I’m kind of tired of this genre though, the ruined-woman trope is overdone at this point. I feel like I’ve read quite a few of these and they all kind of play out the same. Both stellar reads you'll not put down for a moment until you finish. Both stories are incredible, fascinating, absorbing tales that will have you twisting and turning until the reveal very end! Superb! Wow, love the plot twists and the Missouri/Kansas setting. Dark Places was fairly predictable after reading Sharp Objects but that didn't take away enough mystery to keep guessing myself. Now, on to Gone Girl :) loved the movie, I can only imagine the book. Really enjoyed this book and by the end, I couldn’t read fast enough to figure out who did it! I love Gillian Flynn’s style with the time period and point of view changing constantly. ...just as in real life, there’s more than one side to the story! It was interesting how quickly her mind changed when she was offered money to find the real killer. It was a long read, but I couldn't put it down and wanted to solve it in my sleep. I enjoyed both stories but sharp objects was definitely better in my opinion. The ending seems like more could have been said though in sharp objects. And the same with dark places. Dark places was hard to read because the main character is written to be so unlikable but relatable in a way. So good! As usual with Gillian's books, I couldn't put it down! I totally recommend this wonderful, funny, and thrilling read! Both stories were excellent. Plenty of suspense and twist and turns. Characters are well-written and well-developed. Definitely recommend these books.